An exploration of ways black women can empower themselves in all aspects of their lives: professionally, socially, and emotionally. 5.0 out of 5 starsA beautiful, insightful and healing book! A fantastic and much needed book for black women on embracing the feminine mystique for finding healing and balance, as well as your center and power from within your femininity, as opposed to trying to establish personal and interpersonal power in patriarchal ways- through dominance, force of will, aggression, etc. This book highlights the peace and ease that can come from learning to bring the balance of feminine energy to your relationships and interactions, in contrast to the struggle and frustration that women often experience when they live from internalized patriarchal and masculine principles. It is a testament to the power of embracing the feminine aspect. Jones is a voice for a new black women's feminism that both recognizes the innate value of femininity and sees women as equally valuable to men, deserving of equity and respect. This new feminist perspective also encourages women and men to embrace femininity and masculinity as equally valuable, and women to find power and fulfillment through their feminine nature. A must read for all black men and women, as well as for women (especially women of color) interested in effective "self help/self improvement" approaches to a more fulfilling life and relationships. It especially speaks to the challenges many women of color face in negotiating a world in which they are taught by elders, example and/or by experience, that they must take care of themselves, those around them, and "handle their business" because no one else can be relied on to do it for them or help them, and to still know and embrace and operate from their feminine nature. 5.0 out of 5 starsListen Black Women!!!!!!! I would love to own this book but I can't afford due to my very tight budget. 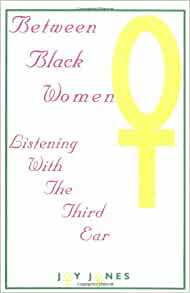 If all the black women in the world read this book it would be like rediscovering themselves. I loved this book and thats why I had to look it up and review it. I also shared it with some friends in school. I located this book in the school library at Eastern Michgan University. I really like the styles that she uses to write. I would like to read other things that she write but again, I do have a budget to maintain. I too want to be a writer but I'm only good at poetry and I don't think my book would be good. I hope that Miss Jones gets to read my review because she is very dear to me at this moment and she has made a big impact on my life these pass few days and may GOD bless her for doing so. Thank you for allowing me to read your book and be the first to review it too. The pleasure was all mines. A good book to start a discussion with Black Men and Women. hile it could go much deeper in regards to historical and present day values and racism effect on relationship,however it begins dialouge on its effects. This is a very informative and helpful book. I have learned a lot and seriously recommend that everyone read it!